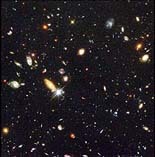 Many of the distant objects revealed in the Hubble Deep Field, a revolutionary image of deep space taken by the Hubble Space Telescope, are too faint for detailed study with existing telescopes. With a new telescope being designed at UCSC, astronomers will be able to probe the faintest smudges of light in the Hubble Deep Field, some of which may show the earliest stages of galaxy formation in the universe. (more).